Congratulations to Sarah, who writes at G.I. Joe's Wife! This is the 2nd giveaway Sarah has won on my blog and I just happen to have met her IRL while on vacation last year. 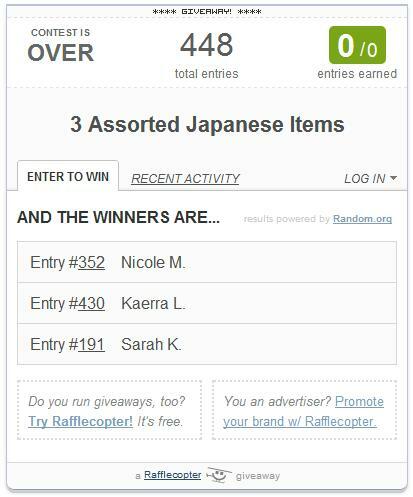 I was blown away by all the entries for this giveaway that was co-hosted by Kara & Darlene. Thanks for all the love and welcome to all the new readers. I hope you'll enjoy your time here! Lol! I still can't believe I won something on your blog again!! I'm kicking myself right now because I LOVE Japanese goodies!! I've been so absent in the blogosphere that I missed this!! Congrats to Sarah! !